This vintage 1951 New York Steinway D (CD 121) was chosen by the Steinway & Sons concert department for Steinway artist promotion. Throughout the years, the instrument has been lauded by some of the world' greatest concert artists. Indeed, the plate of the piano is signed by Glenn Gould, Rudolf Serkin, and many others, as a testament to high praise by the world' great masters. Put your hands on it, and it' not hard to see why. The instrument has an exceptionally clear and transparent sound, yet with a singing tone and mature beauty and resonance that can only be found on a concert instrument in this class. The recording took place in the Fran§oys-Bernier Concert Hall at Le Domaine Forget in the Charlevoix region of Quebec, the same hall where Ivory's acclaimed German Steinway was recorded. Reunited were master concert technician Michel Pedneau, performer/producer Joe Ierardi, and recording engineer, Mark Donahue of Soundmirror to capture every detail of this amazing instrument. With a 49GB library, Ivory II-American Concert D is the largest single piano in the Ivory family. This American Steinway possesses a naturally long sustain, which is captured in its entirety to the final decay, some of the notes ringing longer than two minutes. 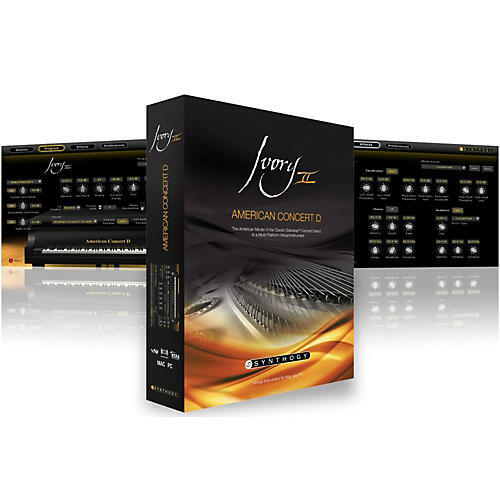 It also boasts more detail than any other piano from Synthogy, with up to 20 velocity levels, more soft pedal samples, and more release samples. Ivory II American Concert D is powered by the award-winning Ivory II engine, and contains the full compliment of Ivory II' features, foremost being our acclaimed Harmonic Resonance Modeling for the realization of true Sympathetic String Resonance. Custom designed by Synthogy DSP guru George Taylor this technology does not rely upon triggering additional samples or use ordinary sine waves. Rather, notes struck that are harmonically related excite the actual complex overtones of the notes that are being held, in the same manner that undamped strings resonate in a real acoustic piano. Together with the new American Concert D samples, the results are simply stunning, the culmination of Synthogy' most powerful technology, with our most advanced sampling techniques.